Wow… So we’ve known a Brandt Peters crossover SQUADT was in the works. Now that the first official teaser shot has dropped of the WIP ‘helmet’ sculpt, we’re impressed. Starting with Brandt’s basic Skelve this design seems to up the realism and darkness with key details such as very realistic cracks and indentations. Can’t wait to see the equipment loadouts on these. 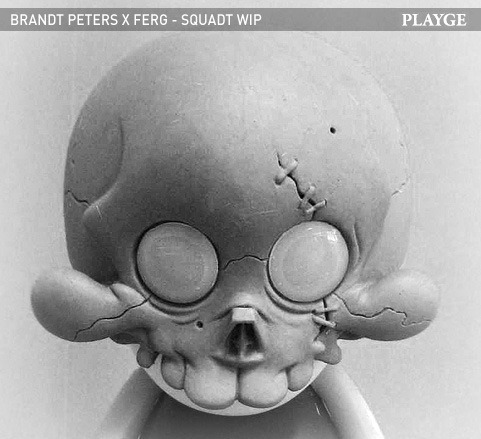 Apparently slated for Ferg’s Playge brand, this new BP Squadt highlights the tremendous ‘platform’ potential of the figure. First there was Kenny Wong’s Copperhead Squadt and now this one, who’s next ? [Via Collect and Destroy]"